Barry Simmons is presented with his service to sport award by Tring chairman Howard Wells and Tring Tornadoes chairman Stephen Bailey. 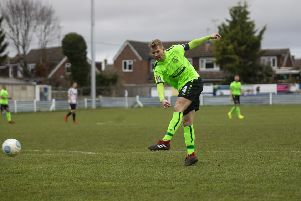 Tring Athletic earned a hard-fought 1-1 draw against top-of-the-table Biggleswade FC in the FA Vase third round on Saturday to ensure they stayed in the hat for Monday’s draw. Athletic, who have been pushing Biggleswade in the SSML Premier table all season, took the lead in the first-half through Mark Riddick but Biggleswade equalised early in the second period via Lee Northfield. The visitors Biggleswade then had a player sent-off but Tring were unable for find a winning goal during the remaining 30 minutes or in extra time. The FA Vase fourth-round draw took place on Monday with Tring set to host either Swaffham Town or Stowmarket Town if they can win the replay. That replay at Biggleswade takes place this Saturday, but before then Tring were due to entertain Chipperfield Corinthiians in the St Mary’s Cup last night (Tuesday) as the Gazette was going to press. Meanwhile, in other club news, Tring’s vice-chairman Barry Simmons has recently been recognised for his contribution to the club by winning the David Wray Service to Sport Award from the Herts Sports Partnership. The award recognises outstanding commitment to sport over the last 12 months and praises the level of commitment and dedication above and beyond the usual level expected of a volunteer. Simmons first became an Athletic committee member in 2000 and then vice-chairman in 2006. He is also known as the club’s gateman on match days and along with Dave Stacey, who was also nominated for an award, undertakes all maintenance work around the club and its outbuildings.